A site in Ferring has been left in disarray after metal detectorists reportedly dug up several areas of turf at a cricket ground. The Worthing Herald reports that several metal detectorists have been digging extensively at the cricket ground at Little Twitten, Ferring and instead of filling their holes, have just left it. The situation came to the local councils’ attention when dog walker Doreen Doig, 78, saw the damage on the cricket pitch and reported it to Arun District Council. The council then wrote to everyone in the local area who holds a metal detecting license to tell them not to dig on sports pitches. This all boils down to simple detecting etiquette. Any good detectorist knows that once you’ve finished detecting you should fill your holes and make sure the area is as you found it. They are also well aware of the golden rule of permission as well. Now this could be overzealous beginners, but surely people with a metal detecting license would know what they are doing and are not likely to leave the area in a mess. The other thing is are the council sure it’s the detectorists’ fault? It could be animals burrowing on the pitch or just vandals trashing it? What do you think of the story? We’ve had a few of our Facebook fans talking about this today. Let us know what your thoughts are and join in the conversation…. If you have just started metal detecting and want to know the rules and what you can and can’t do, check out our guide for beginners on the Joan Allen website. Two weeks ago Jon and Gabby set off on their first metal detecting mission on some land owned by a builder in the village of Pottespury, Northamptonshire. Armed with two metal detectors (the E-Trac and the X-Terra 705) and a vague notion of what they were doing, they set off to see what they could detect. The response to the video has been great, and many people from the Joan Allen community on Facebook and Youtube have offered tips on how to grasp the art of metal detecting. “Always remember to fill your holes & try to leave your search area as you found it as much as possible…..believe me, it can lead to more permissions by way of referrals as it has for me & many others! Take a look at our beginner’s guide to metal detecting video below and feel free to share your tips and advice on how we can improve. Let us know what you think and comment below, on the Joan Allen Facebook page and on Youtube. 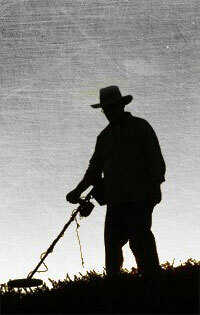 With half term this week, it’s now a better time than ever to go out metal detecting as a family. Don’t let your kids sit inside all day playing FIFA on Xbox or Call of Duty on their PS3, get them out and about and a metal detector in their hands. Metal Detecting is becoming more popular than ever with people of all ages, as it’s outdoors, educational, and a great hobby. It gets the kids outside and not sitting indoors sitting at a screen killing Russians or terrorists all day on Call of Duty. With a range of children’s metal detectors, and prices starting from £115 – the same price as a Wii (£115) and cheaper than a PS3 (£189) and an Xbox 360 (£179) – your children can learn about history in a fun interactive way get them outdoors and detect as a family. We’re even offering 10% off all metal detectors on our Facebook store. It’s got so popular that kids’ TV favourite The Hive has featured metal detecting on its show, urging children to take part and ditch the Game Boy and go out looking for treasure. Peppa Pig and Fireman Sam have also featured metal detecting where Sam introduces Sarah and James to his new metal detector, and they get hooked on looking for treasure; check out our Facebook page where we have the video! So…Jon and I embarked on our first metal detecting mission on Tuesday 7th Feb with permission to detect on some land owned by a builder in the village of Pottespury, Northamptonshire. We had learnt our lesson after nearly being arrested and fined from last time! …I made the fatal mistake of not reading the instructions…again…and I had the E-Trac; big mistake. Jon had the X-Terra 705 which is easier to use as a beginner and more intuitive than the E-trac. I had the manual in the car but this is something you need to read before and not assume, like moi! The land was bumpy and on a hill so you can imagine we weren’t too steady on our feet. It also transpired the land had lots of spoil on it. Jon and I got really excited when we had a strong detection, only to realise it was corrugated iron roof below the ground. That said we were having good fun and understanding more about the equipment and how it detects. Lawrence, the builder whose land it was, knew a bit more than we did and explained about filling our holes back up, sectioning off areas and general advice on etiquette. One thing that struck us was this is such a great hobby for all the age ranges; old and young; Jon thought his kids would love it! You get to use great gadgets, get outdoors and hopefully…or eventually in our case, discover some history! I wish they did this in my History lessons when I was at school! Being super cold and having not read the instructions properly, we decided to head in and ask the boys at Joan Allen Metal Detectors if we could pop down for some advice before trying again…They kindly obliged so we will be heading there to get clued up… we will naturally share their tips and advice in our next blog for all you beginners out there likes us.